"JD Thomas was not my son's first piano teacher, but he has definitely been the best. Over the past 2 1/2 years, JD has really made an effort to get to know my son and personalize instruction to his needs. He's a really nice guy, but more importantly, he really knows how to teach and motivate younger children." "My 2 oldest children (now 10 & 8 years old) have been taking lessons from JD for more than 3 years. JD has been great working with my kids, one of whom has some extra behavioral needs, and is able to keep piano lessons low stress while still teaching a lot in 30 minutes. For our family it is also super helpful that we're able to do lessons in our home and JD is able to provide all of the materials (music, flashcards, etc). JD is able to incorporate music theory as well as site reading and go along with different student's ability/speed levels." "Our 11 year-old son has taken piano lessons from JD Thomas in our home since he was 4, a little over 7 years now. It is quite clear JD is passionate about music and he brings that passion to his students, young and old. It has been such a wonderful experience to watch our son grow in his own love of music over the years. This is a true testament to JD’s dedication to his students. He has truly become a part of our extended family. 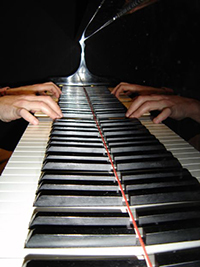 "JD has been an excellent piano teacher to both of my kids for over 8 years! He comes to our house, he is fun & personable and is an excellent musician with diverse knowledge & experience, and a great teacher. He is sensitive to the learning styles of my kids and knows just how adjust his expectations so that they are challenged and still find piano "playing" a joy! I can honestly say, I could not ask for more that what he already offers us already. My kids are well on their way to being great pianist, musically literate and playful composers!" "For nine years, JD Thomas has been a fixture in our home, helping our children develop a love for music and a skill that will carry them forward in life. Working with JD one on one gave our son Tucker the confidence he needed to pick up the alto and baritone saxophones beginning in middle school. If you have a child who wants to try an instrument, there’s no instructor more patient, practical, or flexible than JD. We’ve appreciated every moment he’s spent with our kids." "JD has been wonderful with our seven year-old, Dylan, who has studied with him for the last year. JD has been clear and patient with Dylan, while maintaining high expectations that encourages Dylan to perform. He explains musical concepts in terms a child can understand. Thanks to JD, Dylan has not only learned the elements of music theory but also important practice and performance skills. And it is wonderful that he comes to the house, making our hectic schedules just a little more manageable! We highly recommend him."